It’s been a while since I’ve shared my “Fun Find Friday” meme. This week, the new find is one I am super ecstatic about. It combines two of my favorite things: books and photography! While playing around on Instagram, I discovered Books & Cupcakes‘ “Book Photo Challenge”. 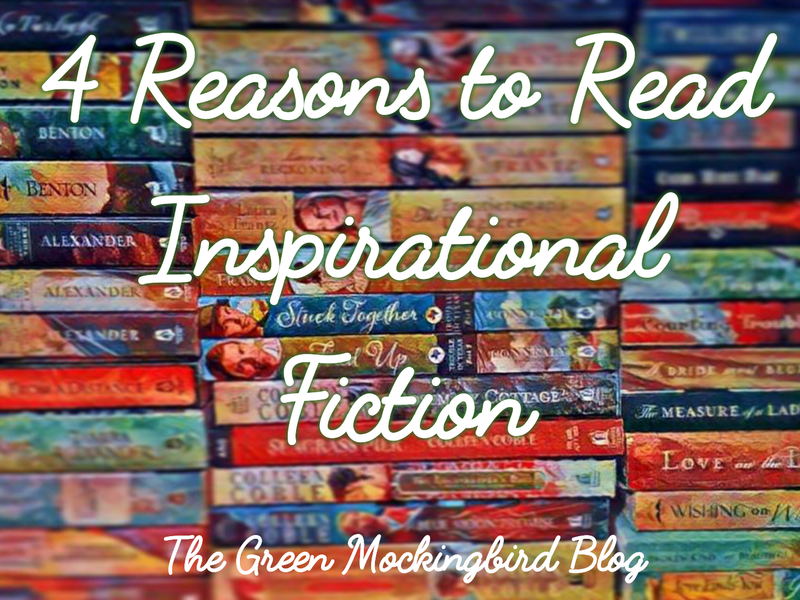 Jessica over at Books & Cupcakes on Tumblr posts a Book Photo Challenge list every month, with an assignment for each day. How fun is that? So, every day, you post on Instagram, Tumblr, or other social media and use the hashtags #bookphotochallenge and #booksandcupcakes. A few days before the next month, she posts the new challenge. I think I’m a little late to participate in May’s challenge, but I’m definitely planning to do June’s. I’ll be posting mine on my Instagram account. If you’d like to join me, please let me know in the comments section! Or, tag my Instagram username @courtneyec90. This is the list for May’s Book Photo Challenge. Don’t these sound fun? Visit Jessica’s FAQ page for more info. Hi, everyone! Last year (2012), I participated in a December photo-a-day challenge. It was so much fun! 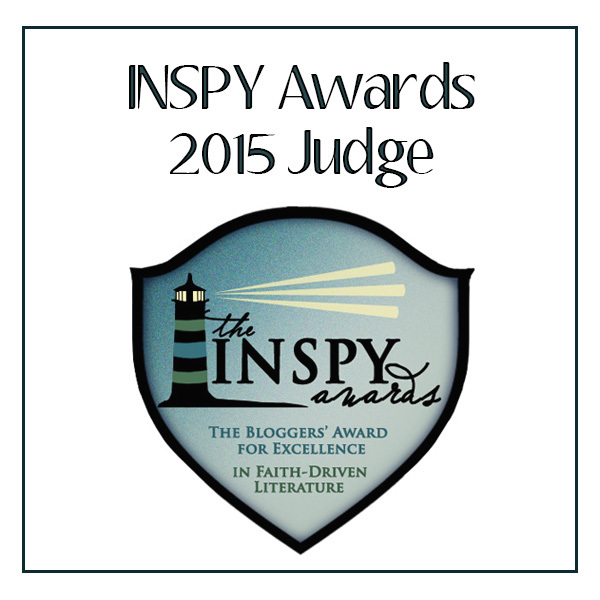 I thought I’d share the links here to all of my posts and photos from last year, just for fun. Or, you can visit my photo set on Flickr to see them all! Are you participating in a photo challenge this December? I would love to follow your progress ~ leave your info in the comments! Final Photos of December Challenge ~ Happy New Year! 29. 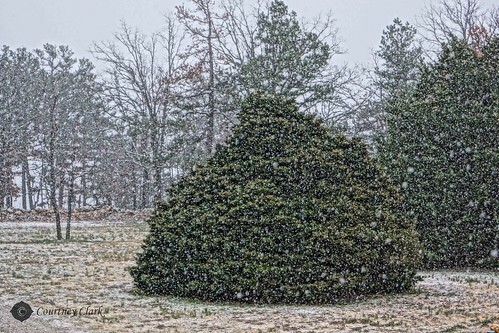 “Sky View” Snowy Cedars, a photo by courtneyec90 on Flickr. 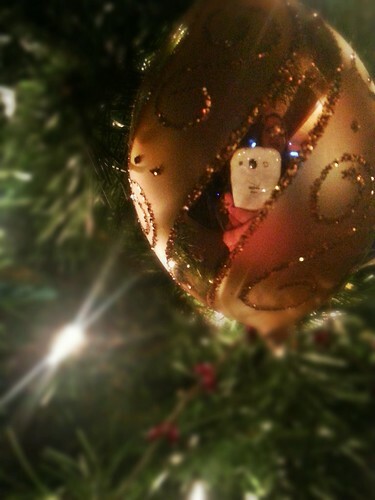 December Photo Challenge, Day 29. This is a view of my skyline…or rather what was falling from the sky. It was gloomy and overcast this day, but the snow was beautiful. This photo was taken with the HDR painting photo effect on my Sony A65. 30. “Your Winter Wonderland” Hungry Cardinal, a photo by courtneyec90 on Flickr. December Photo Challenge, Day 30. 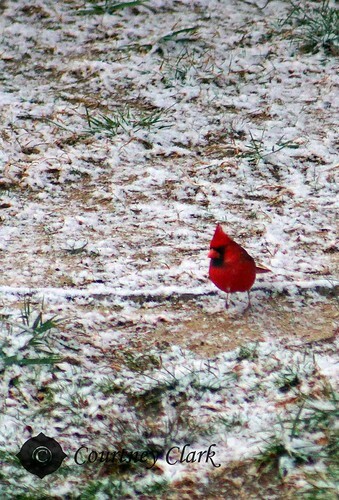 This little cardinal was hungry in the snow. He found some bird seed. 31. “Fun” Ombre Rain, a photo by courtneyec90 on Flickr. December Photo Challenge, Day 31. 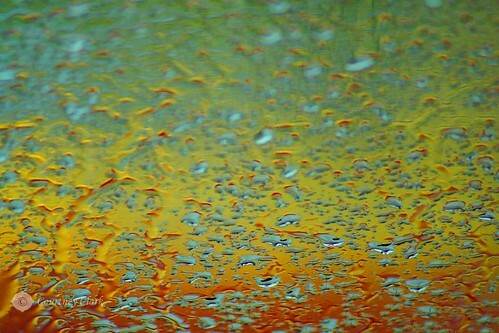 For my final photo, I chose this macro of raindrops on my windshield. This photo was taken with my new lens–I’m really excited to use it for macro shots and distance shots (it’s a Quantaray 70-300mm Macro lens). I would like to say Happy New Year to all my readers and followers! I hope that you have enjoyed seeing my adventures this December through my photo challenge posts. I think I’m going to take a break from photo challenges this January, but I have plans for upcoming photography and craft posts in the next few weeks. 27. “Night Time” After supper, a photo by courtneyec90 on Flickr. December Photo Challenge, days 27 and 28. 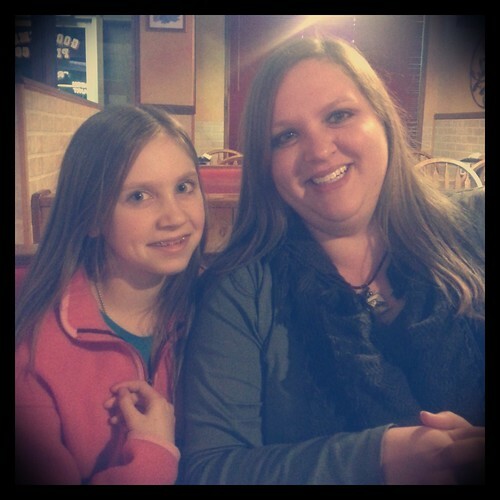 This is another photo of me and my niece hanging out after supper. 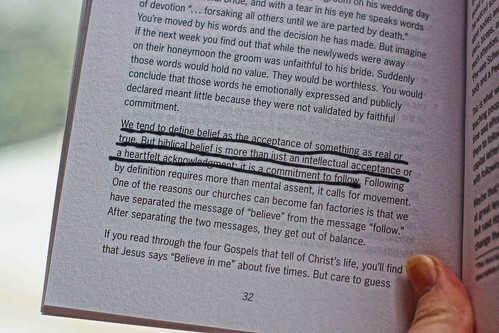 This quote is from Not A Fan by Kyle Idleman, a great and thought-provoking book exploring what it means to be a follower of Jesus. 26. “Grateful” Gold Reflections, a photo by courtneyec90 on Flickr. December Photo Challenge, Day 26. I’m grateful that I was able to spend Christmas with my family. I’m also grateful for my new phone – a Samsung Galaxy S3. 24. 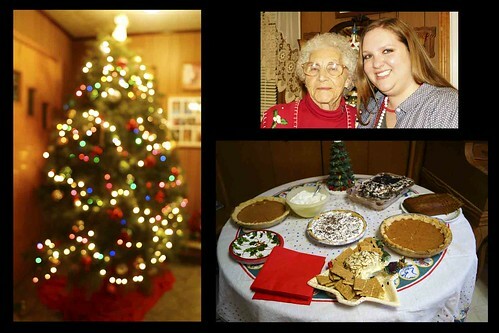 “Favorite Part of Christmas Eve” Grandma’s, a photo by courtneyec90 on Flickr. 25. 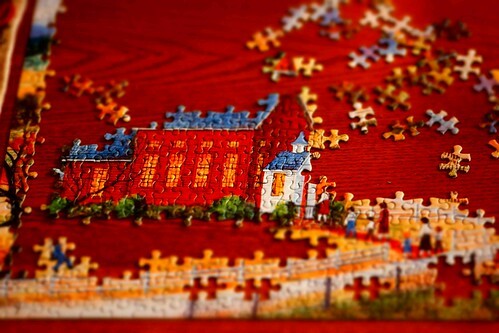 “Morning” Puzzle, a photo by courtneyec90 on Flickr. Merry Christmas! I hope you all have had a blessed day, and that you took time today to remember the reason we celebrate Christmas – our Savior’s birth! December Photo Challenge, days 24 & 25. My favorite part of Christmas Eve is dinner (and dessert) at Grandma’s house. It’s so fun to see all my aunts, uncles, and cousins I don’t see very often. We always have a lot of great food and a fun time visiting. This morning, I began a country scene puzzle I got from my parents. 23. “Scarf” Blue Lines, a photo by courtneyec90 on Flickr. December Photo Challenge, Day 23. 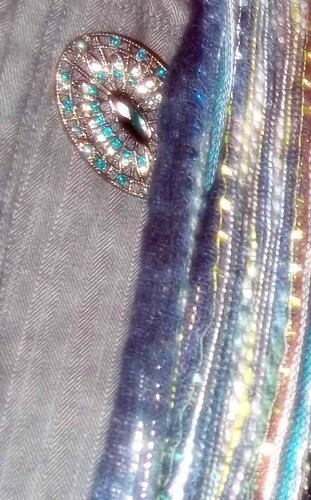 This is my blue scarf and brooch I wore to my church’s Christmas brunch/worship service.